Louis Vuitton will launch Afternoon Swim, Cactus Garden and Sun Song, three fresh cologne-like fragrances, in April. All were developed by perfumer Jacques Cavallier. Afternoon Swim ~ "full of energy", with orange, bergamot, and mandarin. Cactus Garden ~ the contrast between the dry outside / wet inside of a cactus, with smoky mate tea, bergamot and lemongrass. Sun Song ~"the sun in a bottle", with orange blossom, citron and musks. 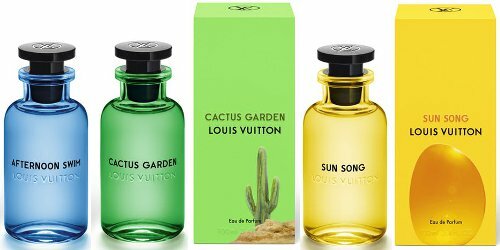 Louis Vuitton Les Colognes Afternoon Swim, Cactus Garden and Sun Song will be available in 100 ml Eau de Parfum, with outer packaging featuring designs by Los Angeles artist Alex Israel. Was hoping someone would have chimed in by now…sorry I have no suggestion! Have you tried Soleil by Fragonard? No! I will look for it. White Tea / Bergamot / Freesia by Korres and Rose Gold by Monsoon have similar notes. Neither is very expensive (though more than Sunflowers) and if you are near a Sephora they often have a decent showing of Korres products for a sniff. Yes, and those boxes are fantastic. I hope they’re not TOO cologne-like at €210 for the 100ml (believe they’re also available in 200ml for €310) !! For that price I want something that lasts longer than an hour especially when they’re the same price as the rest of the range ! They’re EdPs, but who knows. EdPs don’t always last longer than anything else. I saw on instagram a little interview with the perfumer who said his main idea was to create a longs lasting perfume instead of the classic one hour lasting cologne as you mentioned. Hmmmm, Afternoon Swim and the blue bottle seem in contract to the all-citrus notes it contains, I would have assumed an aquatic and passed it by. Now that I know, I need all three of these in my life asap, this non-stop winter cold and snow is killing me. I would not assume all citrus…these are not likely complete lists of notes. Mind you, it might be mostly citrus, but not likely it is a fragrance with only 3 notes. I’m REALLY liking the look of those bottles! Yes, great bottles and packaging! I loved the idea of cactus garden, that green is fantastic and smoky mate tea is divine. I can say that i was satisfied with louis vouitton collection, they have done a consistent job and while the fragrances are not challenging most of them seems to share a leather nuance in different ideas that make them work out as a collection.